﻿ Scan Files. Scan Disks. WinTools.net - software tools for MS Windows. 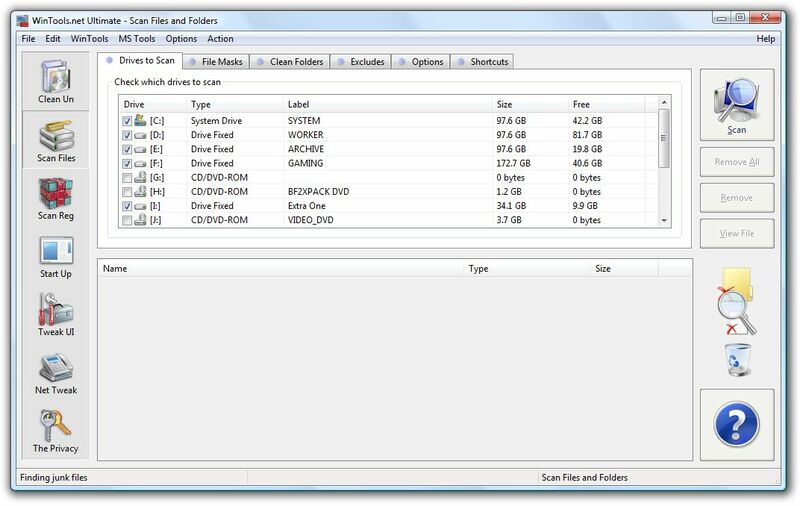 When pressing the Scan button the tool "Scan Files" checks the hard disk for presence of unused temporary files. If a temporary file is found the tool "Scan Files" places it on a list. After scanning you need to delete temporary files using the "Delete" button. 1.The "File masks" bookmark keeps the masks used for searching for these files. Using this bookmark you can add new and delete old masks. 2.The "Clean folders" bookmark keeps a list of files which will be marked as temporary (regardless of their type). The folders Temp and Cookies are usually kept here. 3.The "Excludes" bookmark keeps a list of files to omit from searches. Usually the folder History or important temporary files are kept here. 4.The "Options" bookmark serves for setting up the methods of deleting the files.